If you’ve looked at diet books in the last few years, there’s no doubt you’ve seen a few bestsellers boasting the merits of the Glycemic Index or GI. 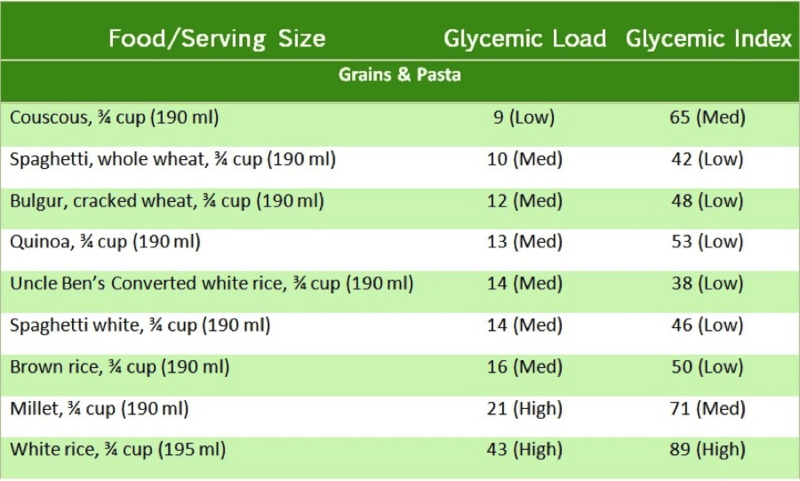 The GI is a ranking of carbohydrate foods from 0 to 100, based on how much the food raises blood sugar, compared to eating the same amount of pure glucose. 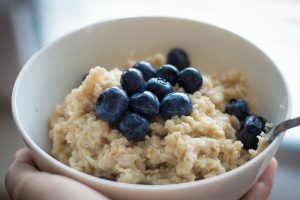 You can lower the glycemic effect of oatmeal by adding nuts and adding low carb fruit like berries to cut the portion size of the oats. Type of starch—some varieties of grain are digested and absorbed into the bloodstream more quickly. For example, arborio rice has a higher GI than converted (parboiled) white rice. Fiber content and solubility—the more fiber a food has, the less digestible carbohydrate it has. Soluble fiber, found in oats, beans and apples, for example, slows down digestion of starch. Ripeness—the more ripe the fruit, the more sugar it contains—and the higher it’s GI. For example a very ripe banana has a higher GI than a slightly green one. The fat, protein and acidity of a food slows down the digestion of starch. Chocolate has a lower GI than jelly beans. Food processing: the more a food is processed, the higher it’s GI. Think instant oatmeal compared to old fashioned oats; fruit juice vs. whole fruit. Cooking: causes starch to absorb water, so it is easier to digest. Soft, well cooked pasta has a higher GI than pasta cooked “al dente”. Refrigerating: when pasta, potatoes and rice are cooked, cooled and served cold, they have more resistant starch and a lower glycemic index. 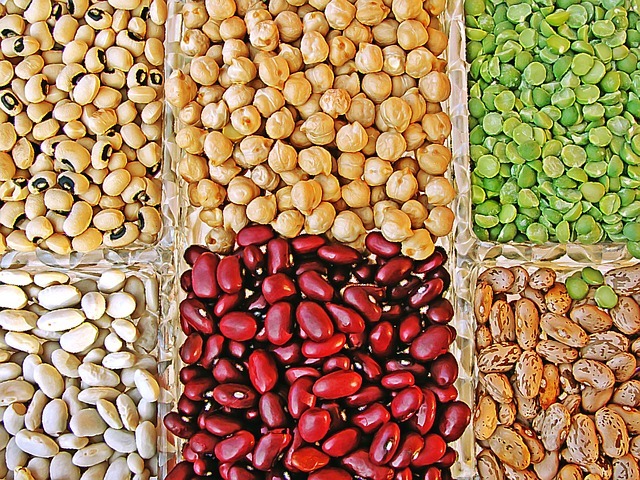 Beans are a great example of smart carbs with a moderate Glycemic Index. Eat more beans, legumes and nuts. Eat high fiber cereals and bars for snacks. Look for ones that contain whole grains like oats, wheat, barley, bran, dried fruit and nuts. Choose dense, whole grain breads and crackers or those with whole grains and seeds in them. Eat five cups of fruits and vegetables daily, with an emphasis on low GI: fresh whole fruits and vegetables. Limit carb-containing beverages to half-cup servings of fruit or vegetable juice. Don’t get caught up in the numbers; just make sure to include a low GI food in most of your meals. Eat more avocados, a low-glycemic food that also provides a rich source of monounsaturated fat, which is good for fertility. 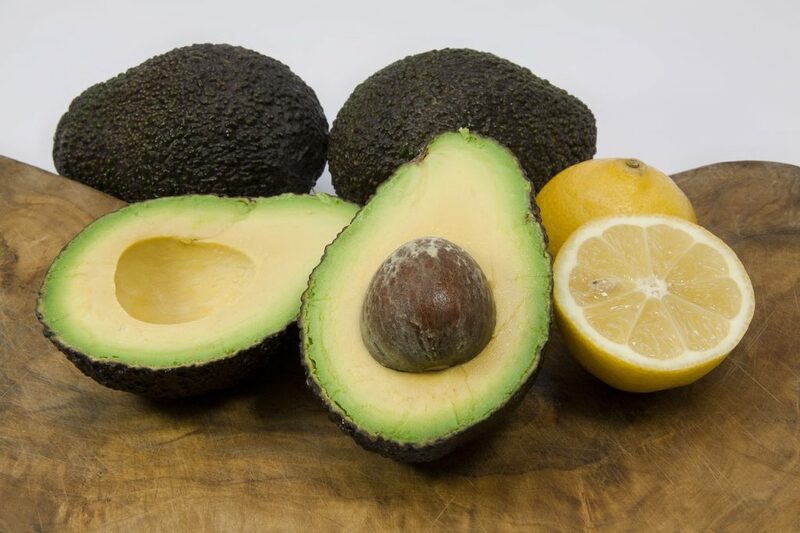 Avocado–a calorie-rich super-food for pregnancy! 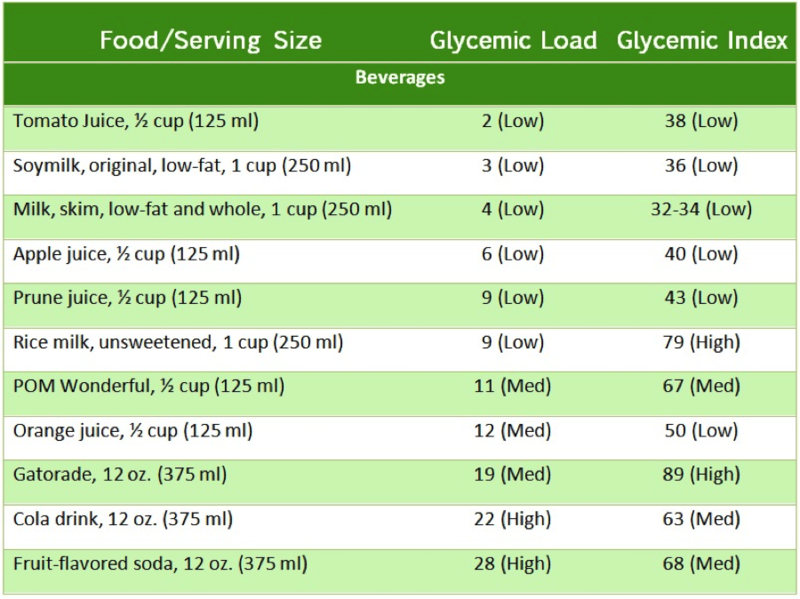 The charts below show the glycemic load and glycemic index for various foods, from the book Eating Expectantly. 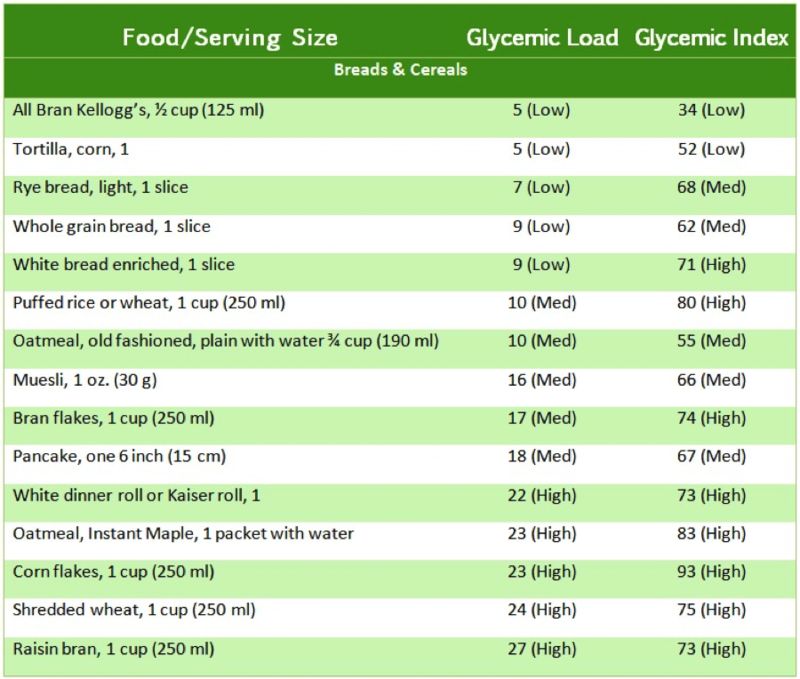 Ranking for Glycemic Index: Low: 55 and under; Medium: 56 to 69; High: 70 and up. So, the higher a food’s GI, the faster it’s digested and the more it raises blood sugar. A diet that has many high GI foods has been linked to increased risk for diabetes, high cholesterol, heart disease and overweight. On the other hand, a diet rich in low GI foods appear to help control diabetes, blood sugar and helps with weight loss. Another thing to consider about using the glycemic index—most of the time we eat a mix of foods that have a range of GIs. 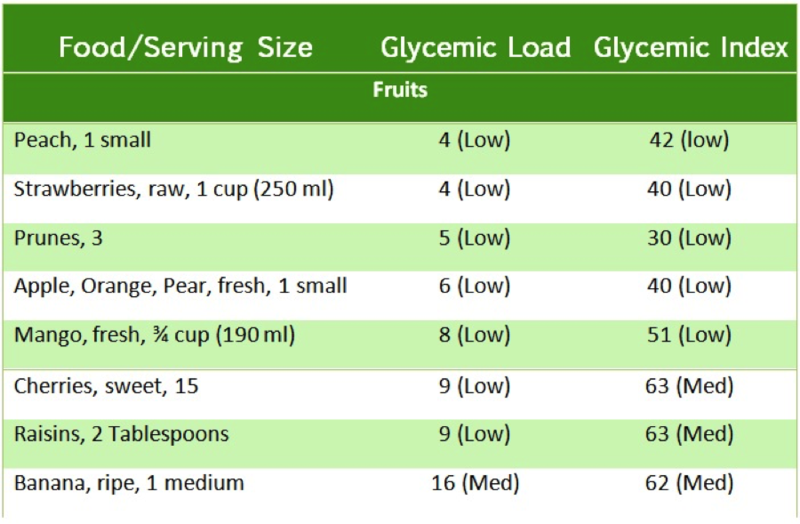 Note: Glycemic Index and Glycemic Load vary by brand, variety, cooking method and serving size. 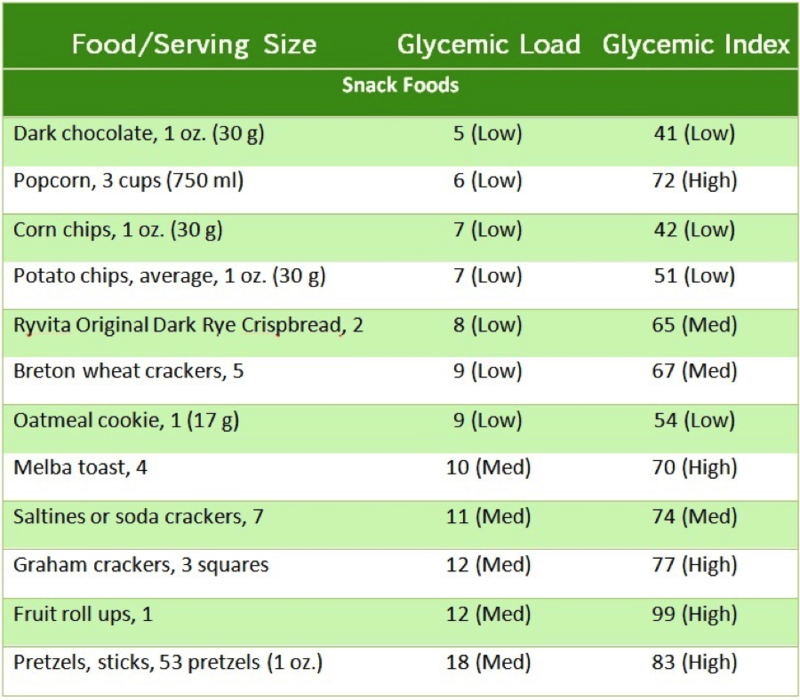 Ranking for Glycemic Index: Low: 55 and under; Medium (Moderate) 56 to 69; High 70 and up. 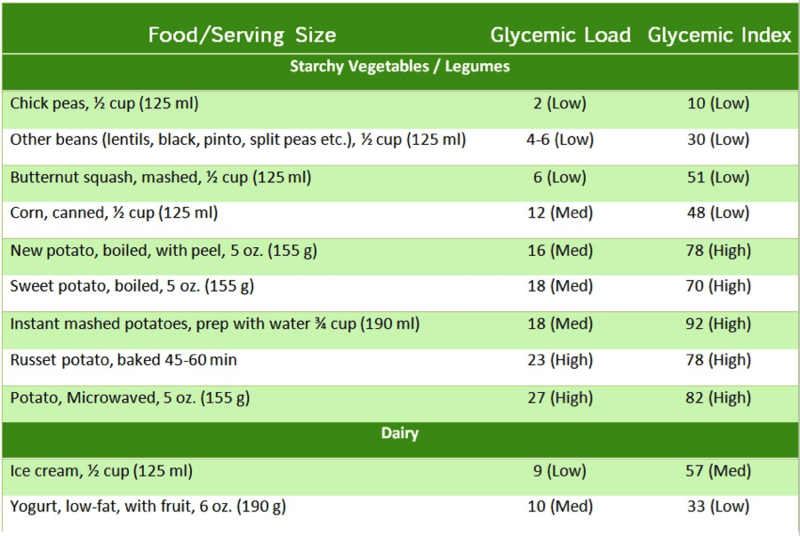 Foods low in carb, like non-starchy vegetables, have a very low GI and GL. « Welcome to The Fertility Project!